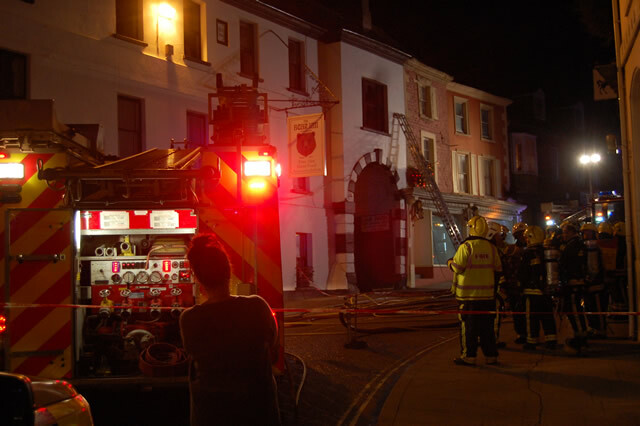 On Christmas Eve at around 8.00pm Christmas celebrations at The Bear Hotel, Wincanton, were brought to a halt when a fire broke out in the chimney breast on the top floor. Staff discovered the fire and called the emergency services. An appliance and crew from the Wincanton Fire Station attended the scene within about eight minutes. The crew fought the fire using small tools, with thermal imaging to monitor hot spots. Over the next hour the fire seemed to be under control, but flared again unexpectedly. At that time the decision was taken to request more support, and to evacuate all customers and staff. Support appliances and crews were brought in from Castle Cary, Gillingham and Mere. At its worst the fire spread from the chimney through to skirting boards on the second floor, causing smoke and fire damage throughout the building. To bring the fire under control and eventually extinguish it, the fire crews used six sets of breathing apparatus, four hose-reel jets, one safety jet, four thermal image cameras, and one stirrup pump. The police also attended the incident to control traffic around the scene. Thankfully no-one was injured, and although a sign on the door says ‘Closed Till Further Notice’, hotel manager Carol Whitwell said that they hoped to re-open for business on Wednesday 30th at 11.00am.